There is a growing number of women who are forging paths and leading the way in innovative biodiesel research. Two such women are Megan Hums, a student at Drexel University, and Jennifer Greenstein, a student at North Carolina State University. 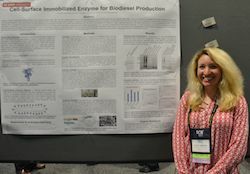 They are both members of the Next Generation Scientists for Biodiesel program and they both presented posters during this year’s National Biodiesel Conference & Expo. I spent some time with both young women to learn about how they became interested in biodiesel/bioenergy. These are some amazing young ladies! After Megan graduated with her undergrad degree she said she felt she still had more to learn. 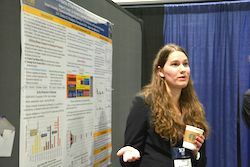 With her interest in sustainability and biofuels she found a project at Drexel University (She’s in her fifth year of her PhD program and graduating soon. Contact her here.) that interested her using waste greases for biodiesel production. She has been involved with this project and it was the focus on her poster.